Over the next two weeks, you will become reacquainted with some of the twentieth century's seminal tastemakers, designers, and muses -- many of whom are now unjustly fading from public memory. In 2007, we launched on this site a column called Lets' Bring Back -- which has, over the past three years, celebrated hundreds of forgotten-yet-delightful fashions, pastimes, objects, and personalities. On November 1, 2010, Let's Bring Back will make its debut as a book -- and in honor of its release, the Huffington Post's Style section will spotlight ten historical style icons featured in the book's pages. Over the next two weeks, you will become reacquainted with some of the twentieth century's seminal tastemakers, designers, and muses -- many of whom are now unjustly fading from public memory. Once you've spent some time with them, you'll agree that each of these women deserves to remain in the limelight. After all, fashion is fleeting, but true style glimmers forever. Our first ICON OF STYLE profile on Josephine Baker created quite a splash over the weekend. Our second ICON OF STYLE, designer Lilly Daché, was equally influential in her day. While she personally may not have had the visibility that Ms. Baker enjoyed, Ms. Daché shaped the way an entire generation of women adorned themselves. A pre-eminent mid-century hat maker, Ms. Daché dressed that era's stars and became synonymous with a delightful accessory that, like Ms. Daché, deserves a comeback. Read on. 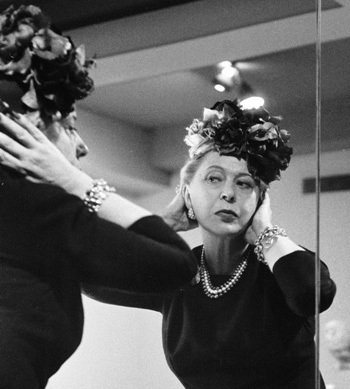 French-born Lilly Daché was the most celebrated milliner in the United States during the 1930s and '40s -- a time when hats were the centerpieces of a woman's wardrobe. As The New York Times noted in Daché's obituary, during the Depression, "women with limited funds tended to buy new hats instead of new clothes. In the 1940s clothing fabric was in restricted supply because of World War II, and hats continued in demand because they were showy." Daché's wildly creative hat designs were coveted by all fashion-minded females and touted as status objets by practically every major movie star of the day, including Greta Garbo, Marlene Dietrich, Carmen Miranda, and Jean Harlow. Like so many fashion industry powerhouse doyennes of her era, Daché was a rags-to-riches icon: arriving in America in 1924 with thirteen dollars in her pocket (or so the story goes), she saw a sign in a window on a shop on Broadway saying "Milliner Wanted," and history was set in motion. She eventually bought the shop from the owner, and soon became a household name across the country. Daché could be as flamboyant as some of her designs; according to one of her biographers, Daché often conducted business from her bed, "dictating letters, buying supplies, designing, and interviewing employees while wrapped in a leopard-skin rug." Sometimes meetings were held in her bathroom, where Daché would give orders from a deep bubble bath. Brunette celebrities were guided to a fitting room decorated in shimmering silver; blonde clients were ushered into a dressing room of gleaming gold. Wholesalers were treated to a circular room swathed in tufted pink satin. Bells adorned Daché's leopard-skin slippers, perhaps "to warn her girls of her approach, a job later undertaken by her armful of jingling bangles." "I like beautiful shoes in gay colors, with thick platforms and high heels. I like splashy jewelry that clinks when I walk, and I like my earrings big. I am Lilly Daché, milliner de luxe." 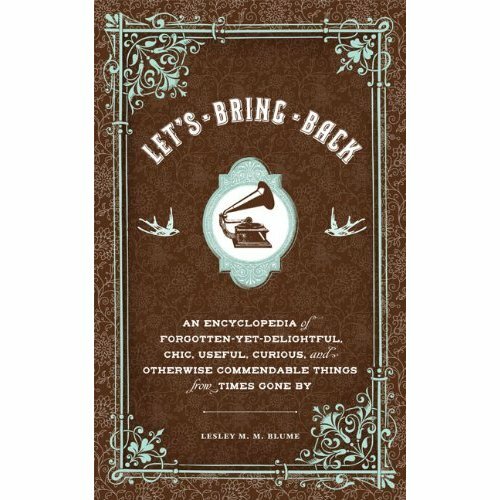 BUY THE BOOK: Click here to purchase Let's Bring Back.